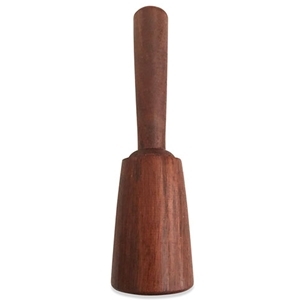 This imported well-balanced one-piece mini mallet, weighing just 4 ounces, is designed to use with small to medium clay modeling, stone carving and wood carving tools. Soft gentle percussion strokes with this mallet will deliver fine detailing lines and delicate shaving results. Crafted from Acacia Wood, an extra hard, durable wood which is water-resistant. The mallet's head is wax-coated to prevent possible checking. Approximate length of the entire mallet - 7.5"; approximate height of head - 3"; width of head - 2".